On Saturday, December 8, 2018, 242 fisherman attended the first 2018/2019 San Bernardino County Regional Park Trout Derby. The derby was held at Cucamonga-Guasti Regional Park in Ontario, CA. A total of 65 trout were caught and registered, with the top trout weighing in at 9 lbs. 2 oz. 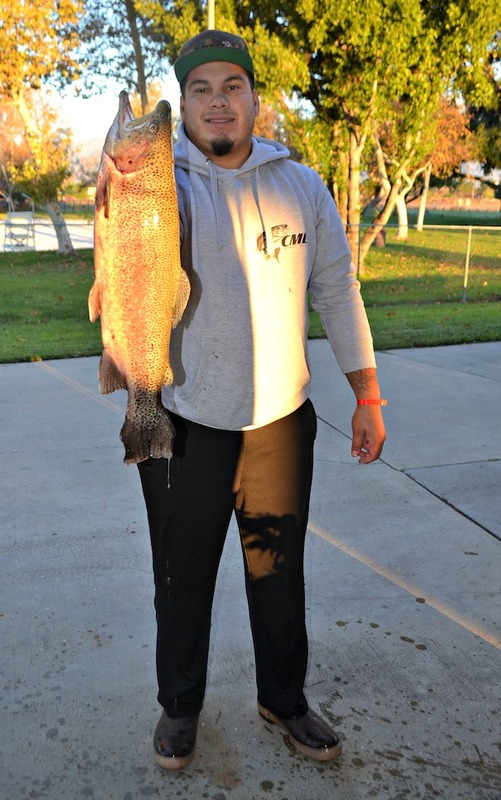 It was caught by George Belmarez from La Puente, CA using Red Trout King Worm. Twenty-four additional prizes were given out for trout weighing 7 lbs. 6 oz. to 3 lbs. 6 oz. First Place – George Belmarez from La Puente, CA. Trout weighed 9.02 lbs. Caught using Red Trout King Worm. Second Place – Steven Lemon from Pomona, CA. Trout weighed 7.06 lbs. Caught using Croppy Jig. Third Place – Darrell Freeman from Ontario, CA. Trout weighed 6.09 lbs. Caught using white jig. Fourth Place- James Leon from Ontario, CA. Trout weighted 6 lbs. Caught using a CML Baits jig. Fifth Place- Victor Hernandez from Fontana, CA. Trout weighted 5.13 lbs. Caught using Mini jig. Next All Ages Derby will be Saturday, January 12th at Glen Helen Regional Park.